We put extensive care and thought into the design and construction of our one bedroom apartments and two bedroom townhomes for rent in Mesa, AZ. After all, this is the place you come home after a busy day to restore and relax. In the spirit of affordable luxury living, we feature spacious floor plans and upscale finishes. You keep your environment attuned to your taste with central air conditioning, ceiling fans, modern window coverings, and individual hot water heaters. We can’t take credit for the incredible desert views, but we did think to include a private balcony from which to enjoy them. Come home to high-end apartment living at Waterford Place Apartments. 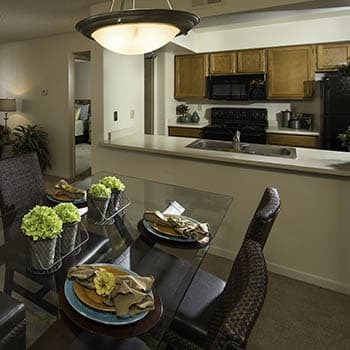 The living is good at Waterford Place Apartments in Mesa, AZ. Come by for a visit. We’d love to show you around our beautiful apartment community.